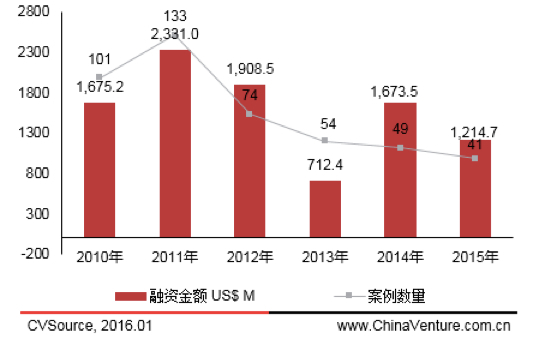 A total of 41 venture and private equity investment deals in Chinese clean tech companies with aggregate deal value of US$1.2 billion were recorded for 2015, down 16.3% and 27.4% from the year earlier, respectively, according to data from ChinaVenture. But mergers and acquisition deals were active for the past year, with 568 transactions with US$27.1 billion in total deal value announced during the year, a record for the past few years. Completed mergers and acquisition deals amounted to US$8.1 billion in total. Because of the temporary closure of China's IPO market last year, only ten Chinese clean tech companies completed an initial public offering, down 23% from 2014. Total proceeds from the IPOs, of which three were in Shanghai, four in Shenzhen and three in Hong Kong, amounted to US$2.6 billion, down 40% from 2014, according to the data.